Statistics show that, despite improvement in the overall number of women enrolling in STEM programs at U.S. universities, the rate of STEM degrees actually awarded to women remains low. While there has been some improvement in the biological and biomedical sciences, the workforce gender gap for STEM fields remains wide—women comprise only about 25.8% of those in STEM occupations. 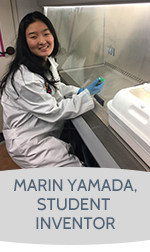 The Archer School for Girls in Brentwood, California, and students like Marin Yamada, are on course to help change those figures. 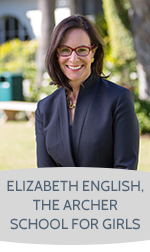 “Archer was founded with the specific mission of empowering young women to ascend to leadership in an environment that is fundamentally innovative, collaborative, and progressive,” says Elizabeth English, Head of School at Archer (see Elizabeth English interview below). As part of that, the school encourages “experiential learning,” particularly in STEM fields. Now a senior at Archer, and a student at Archer for seven years, Ms. Yamada has benefited from this model, which includes computer coding as one of four key language requirements, and exposure to basic concepts of engineering, computer science, and hands-on research as early as sixth grade. Armed with the tools and confidence to manifest her idea, Ms. Yamada spent the next two years developing a lateral flow assay test—the same technology used for a pregnancy test—to detect Lyme disease. She developed a successful prototype, and is now working to refine and improve it. Here, Ms. Yamada explains more about her invention and her experience with the patent system, while Ms. English weighs in on what more can be done to empower girls to excel in STEM fields. Can you describe your invention and the technology involved? The type of test is called a Lateral Flow Assay. It’s a detection format that’s used in something like a pregnancy test. I’m revising it, because I’m doing a second year in Honors Research and once you’re in the lab, things do change. I’m experimenting between making it a sandwich lateral flow assay versus a competitive lateral flow assay. It relies on the antibody-antigen interaction and the affinity between them, and then it utilizes nanoparticles. I’m in the process of experimenting with various adjustments to the traditional lateral flow assay to make it suitable for applications where you need to detect proteins in low concentrations. I’m also experimenting with various pre-treatment steps. With a pregnancy test, for example, the proteins found in the urine of pregnant women come in very large concentrations, whereas in Lyme disease it comes in very sparse concentrations, so I’m going to need to concentrate those proteins so I can detect them. Hopefully, I’ll have results in the next few months, which is really exciting. Once you thought of the idea, did you have any sense of how hard it was going to be to actually invent? I hadn’t even heard of Lyme disease before that episode. My initial proposal was completely different than what I wound up working with. Coming up with a procedure and concrete plan was much more difficult than I imagined it would be. I remember sitting in my room for 12 hours straight, drawing up sketches after reading 200 research articles, and looking at other people’s designs and thinking about how I could improve upon them. Eventually, through the process of sketching and then going to the lab and testing it over and over again, one revision finally ended up working. I didn’t really ever see an end to it, I thought, “I could be doing this for the next five years for all I know!” It was a very hard—but empowering—process. How did you gain access to all the equipment you needed? It’s a privilege for us to consume these works, so we should definitely be making sure they get the right compensation and reward. Our high school lab doesn’t have fancy equipment like sonicators, but we do have basic lab tools like centrifuges, incubators, refrigerators, freezers, and microwaves. The most important tool I have at Archer is teachers who really care about your success and are willing to come up with unique solutions that can help to deal with those problems. I used a UCLA lab once or twice; there was a wonderful man there who was willing to lend me his sonicator, because I really needed that machine. There were other problems I was able to solve at our high school lab though. Are you in the process of patenting the test? Following my presentation at the Archer STEM Symposium, I met with lawyers who specialized in patents and IP. We got the ball rolling on the patent process, but then I realized this year that my idea is probably going to change. In the patent world, if you change one thing it becomes a completely different patent, so I thought it would be a better idea to file for a provisional patent in the next few months. Was this your first introduction to patents? Now that you know more, why do you think some young people see IP rights as a negative thing sometimes? I think young people tend to view companies that possess IP rights as people who are greedy and already have a lot of money. That’s the logic in a lot of young people’s minds. I think what’s missing is that you’re taking money away from people who have worked so hard to make an album or in the lab to generate a product that can be used by a wide audience. That connection is missing, and I think it does stem from a lack of understanding. Authors and inventors should be rewarded and credited for their effort and work. It’s a privilege for us to even consume these works, so we should definitely be making sure they get the right compensation and reward. How do you think schools and companies can help bridge that gap? I think it would be helpful for schools to educate students on the kind of process that goes into making a product and how the business world operates. I think that schools can really educate students on the kind of process that goes into making a product and how the business world operates, but what I think would be most helpful is to have students just go through the process of creating—whether in literature, science, or art. If the younger generation begins to experience even a little bit of what people in the real world do, we’ll be able to bridge that gap and better empathize. I have a few other ideas for inventions. I’m writing a proposal for a collar for dogs and cats and an app to de-escalate the problem of missing pets. And I will be attending college and continuing invention and science. I want to be immersed in an environment where I can think creatively and work on my Lyme disease test, but I really want to branch out into other areas as well. I studied coding last summer and want to branch out into computer science, because I think that’s where a lot of our future is and it’s just fascinating. Our lives revolve around technology and I think it can be really beneficial to humankind. What advice do you have for other kids who want to invent? I think my main advice would be just go for it. I know it can be intimidating, but focus on the scientific process itself and less on making something that’s going to change the world or be the best. That mentality can be really damaging to the process, because science—the ability to experiment and discover something new—is really beautiful. I went through hundreds of minor or major changes, but every change really does benefit your experiment and project. Also, we should be thankful that, as young people, we even have the power to make a difference in a lab. That’s a really special thing that not many high school kids could have done 40 or 50 years ago. It’s a privilege we’ve been given and we should embrace it. What drew you to working in girls’ schools? I saw a real dearth of women at the highest levels of educational leadership. If you look at the data, it’s clear that, while roughly 75% of the people who work in schools are women, they account for less than 25% of the heads and principals. The higher up you go, the worse the statistics get. That’s ultimately what motivated me to become an educational leader. I also believe in fundamentally innovative education, but what really drove me to girls’ schools was their mission to explicitly promote female leadership. How do girls’ schools do that better than co-ed schools? At Archer, about 29% of our students go into STEM fields, compared to 2% of girls who attend co-ed schools nationally. A lot of that simply has to do with the confidence gap. When you’re in an environment for 12 years where the only person called on is a girl, and the only leaders in student government are girls, it has an incredibly powerful impact on confidence. There’s never a question about whether a girl can be a coder or a leader or an engineer, that’s all they see. We also know from the research that because of gender bias, whether we’re men or women, we call on boys more, we give them more praise, we interrupt them less. Over a lifetime of schooling this has a cumulative impact on a girl’s confidence. So when you remove that variable of gender bias, it’s incredibly empowering for a young woman. The first three female Secretaries of State were all girls’ school or women’s college graduates. Worldwide, over 70% of the female heads of state are either girls’ school or women’s college graduates. They get out there and they never question themselves, and they’re also conscious of gender bias, so when it happens they don’t internalize it. How does Archer use this model to promote STEM specifically? When we looked at the disproportionate percentage of female leaders who had graduated from either a girls’ secondary school or women’s college, people began realizing there was something important happening in those environments. At Archer, we think that, particularly in the STEM fields, one of the biggest barriers to pursuing those programs in college is that girls don’t have enough role models to be able to see themselves in those fields. It’s really important to us that girls have ample opportunity to do engineering and science research so that the younger students in the school see the older girls engaged in these pursuits. We have an inquiry-based approach to learning. There’s obviously content coverage, and we believe that’s important, but we also believe the human mind has a basic need to inquire and discover. This is particularly powerful in children. You really have to set up your curriculum and school day in a way that allows time for inquiry and guided discovery. All of our sixth graders have a world language rotation. They take a quarter each of Spanish, French, Chinese and Coding. We believe Coding is a universal language and that all students should be proficient in a variety of Coding languages by the time they graduate. Science is research, not memorizing a textbook. We don’t reserve research learning for upper school students. We have the“Little SIS Symposium” for middle school students, in which the middle school conducts inquiry-based science research on a smaller scale than the older girls. They get exposure to concepts of engineering, computer science, and research right off the bat. In terms of engineering, we have all types of courses and units that teach girls right away that they can be designers and engineers, including courses on game design and app creation. Most girls don’t have the benefit of an environment like Archer’s though— what more do you think can be done to encourage women in STEM overall? It’s really important to us that girls have ample opportunity to do engineering and science research, so that the younger students in the school see the older girls engaged in these pursuits. What’s really discouraging to me is what’s happening in higher education. We see more women majoring in STEM fields, but they continue to drop out at a very high rate. A lot of these colleges and universities will brag that 40% of their freshman class in the school of engineering are women, but ask them what percentage graduate—it’s heartbreaking. I think what’s happening is that colleges and universities first of all have very few female professors. Women walk into classrooms that are predominantly male and then the professor is also a man. That can be very intimidating and discouraging. But we also don’t teach engineering in an inquiry-based way in college. We deliberately teach courses that are designed to “weed people out,” and girls are much harder on themselves than boys. I think we’re teaching it backwards. Marin mentioned in her interview that it would be helpful for students to have more exposure to IP in order to better understand the need for IP protection. Have you considered incorporating courses on IP? This is the new frontier for us. Just last year, we started to realize that we had kids who were inventing things that needed to be patented. I think there was a lag in our understanding of how critical it was, and how we could best help students and protect both them and Archer when there is IP at stake. Dr. Gary Michelson [IPOEF Board Member] forwarded the work IPO did with 20 Million Minds and we’re definitely going to be working with that curriculum now. We’ve been talking to our attorneys, because it’s not simple in a school setting. Most secondary schools haven’t even begun to think about these things. There are a lot of concepts like IP and business ethics that we’re playing catch-up with, but we are getting on top of it now. What would you like to say about Marin’s invention? I think it is a shining example for schools and educators everywhere. Young people are wired for invention and discovery, and schools need to be places where we support and foster that and not frustrate it. The thing I love about Marin is it never occurred to her that she couldn’t do this. She has incredible perseverance and optimism. We talk a lot at Archer about the “centrality of grit” for highly successful people. That’s a term used by Angela Duckworth, a professor of psychology at the University of Pennsylvania, for people who have that zest, optimism, and resilience. All of those qualities are so obviously part of who Marin is. I’m proud of Archer for creating the environment, teaching, and learning structures that enabled her to pursue something like this, and giving her the time and resources to do it, but I think at the end of the day Marin just has all the right qualities of an inventor.